A detailed map of the Portuguese colony in modern-day Angola. 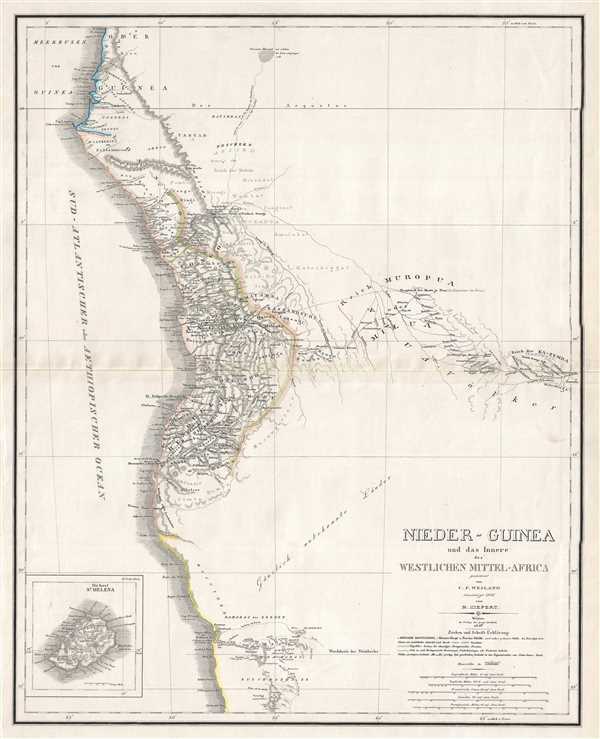 Nieder-Guinea und das Innere Westlichen Mittel-Africa. This is an 1846 Carl Ferdinand Weiland and Heinrich Kiepert map of southwestern Africa. The map depicts the Atlantic coast of Africa from approximately modern-day Gabon to central Namibia, including parts of the modern-day countries of Angola and the Democratic Republic of the Congo. Predating the German colony of German Southwest Africa (modern-day Namibia) by nearly forty years, the complete lack of knowledge about the interior of the region is evident. A detailed depiction of the coastal region of what is today central Angola is illustrated, with numerous Portuguese settlements underlined in green, including São Paulo da Loanda, which is called Luanda in contemporary Angola, and is the country's largest city. The original Portuguese settlement is highlighted by the thick green line separating the coastal region from the rest of the continent. It appears that an expedition into the interior is traced from Luanda to Lucenda, but it is unclear which expedition the map is highlighting. Place names are noted in various different fonts, with the finer fonts indicating names that Kiepert was unsure about. This map was created by Carl Ferdinand Weiland and corrected by Heinrich Kiepert for publication by the Geographishces Institut in 1846. Very good. Light wear and toning along original centerfold. Verso repairs to centerfold separations. Blank on verso.